It’s a small drone that require a one man crew, equipped with a 4K camera. It’s a great drone for indoor flights. It provides a rocksolid HD video downlink on an 10 inches monitor. 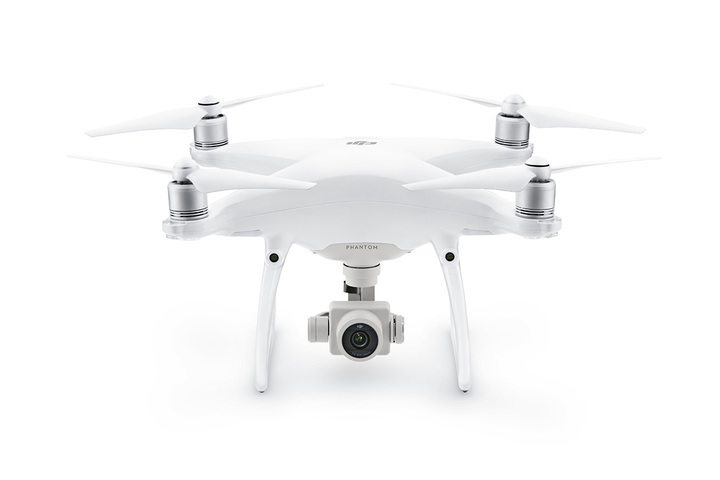 The Phantom 4 Pro boasts a 3-axis-stabilized gimbal camera with a 20MP, 1″ CMOS sensor capable of shooting up to 4K/60fps video and well as photo bursts at up to 14 fps. The hull has been updated from the previous Phantom 4, now featuring magnesium alloy construction for increased rigidity and reduced weight. The FlightAutonomy system adds dual rear-vision sensors plus infrared sensing for a total of five directions of obstacle sensing and four directions of obstacle avoidance. Sensor size is often more important to image quality than the number of pixels, because a larger sensor has dynamic range, better signal-to-noise ratio, and boosted low light performance. The 1″ 20MP CMOS sensor in the Phantom 4 Pro is almost four times the size of the Phantom 4’s 1/2.3″ sensor. It uses larger pixels and has a maximum ISO of up to 12,800 as well as increased contrast. Capturing objects moving at high speed has always been a challenge for flying cameras using an electronic shutter. This is why the Phantom 4 Pro is the first DJI Phantom to use a mechanical shutter and a large-aperture prime lens. A maximum mechanical shutter speed of 1/2000-second eliminates motion blur and “jello effect” caused by shooting a fast moving object with a rolling electronic shutter. The electronic shutter has also been improved with a max shutter speed of 1/8000-second, and a there is Burst Mode shoot capable of shooting 14 fps at 20 megapixels to catch the perfect moment.